Anabaptist History – A Splash of Love…. My intention is not to belabour Menno Simon’s teachings, but his views on Excommunication deserve further exploring, in my opinion. 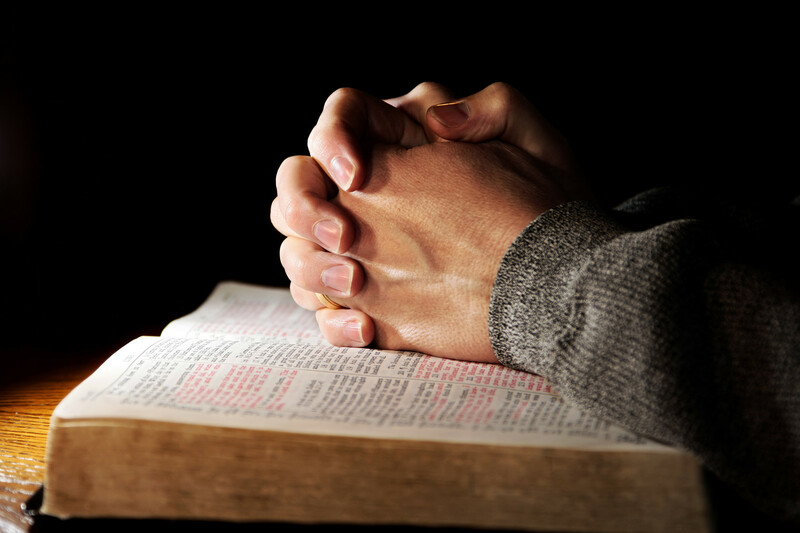 When an individual sins (privately, as Menno calls it, meaning a sin that is not known publicly) Menno urges the church to deal gently and privately with the sin. If the individual confesses a sin to a ‘brother’, it is not to be taken to the church for discipline, with the exception of a criminal act. 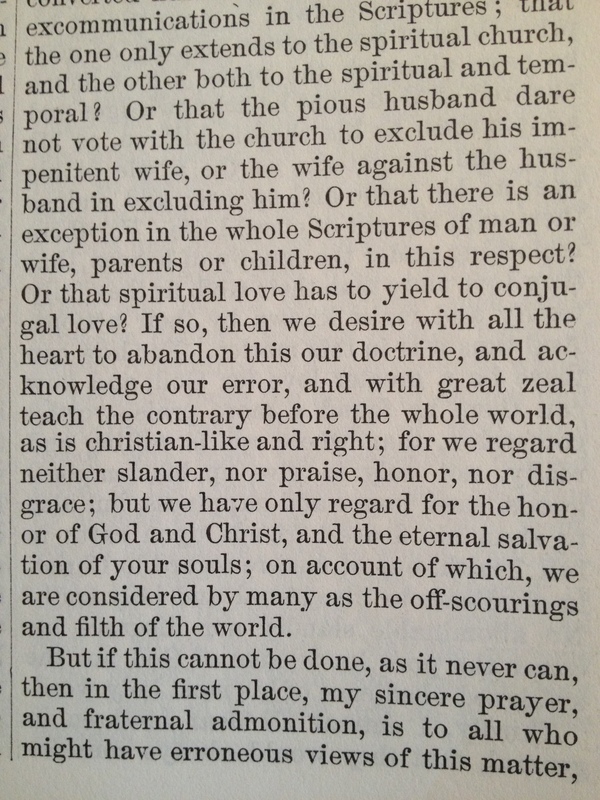 “I understand that […] brethren are of the opinion that if some brother should secretly have transgressed on something or other, and, in sorrow of heart should complain to one of his brethren that he had thus sinned against God, that hen this same brother should tell it unto the church; and if he should fail to do so, that he, then, should be punished with the transgressor. This opinion is not only absurd but it sounds in my ears as a terrible one. For it is clearly against all Scripture and love, Matt. 18: Jas. 5:19-20. 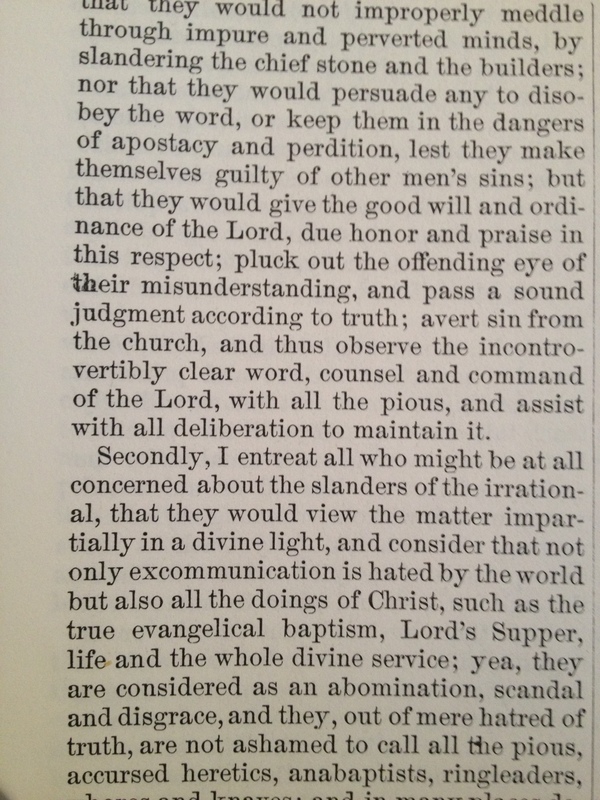 Excommunication was, in one respect, instituted for the purpose of repentance. Now if repentance is shown, namely, the contrite, sorrowing heart, how can excommunication, then, be pronounced against such. O, my brethren, do not put this doctrine in force, for it will lead to sin, and not to reformation. If we were thus to deal with poor, repentant sinners, whose transgressions were done in secret, how many would keep from repentance, through shame. God forbid that I should ever agree with, or act upon such doctrine! Lastly, I understand, they hold, that if any one, in his weakness, transgresses, and openly acknowledges his transgression, that they should consider him, then, as a worldling. This, again, is an absurd doctrine; for, if the transgression was done through weakness, then, let us not be arrogant and too hard on the poor soul, lest we commit a worse fault. In a nutshell, Menno discourages running to the church with every sin confessed to us. In other writings he instructs that relational issues, where ‘brother sins against brother’, reconciliation and forgiveness is to be pursued according to Matthew 18. He distinguishes between a sin against God, and a sin against each other, in that we cannot forgive a sin against God. An individual must seek forgiveness from God, but we are to forgive a sin against us. Where these relational offences, sins, and hurts can be resolved without church involvement, and the offender takes ownership, it is not to be handled at a church or public level. All public sin, however, in Menno’s teachings, needed to be confessed publicly, but, again, he distinguishes between sin and offences that are not sin, if I understand him accurately. Where a crime is committed, Menno does not allow for warnings and second chances before discipline. He addresses this, in the same letter, in response to having heard that there is a ‘violent dispute’, between two opposing views on excommunication. One would like to see church members get three warnings before discipline, and the other insists on heavy-handed, no warning excommunication. He speaks against both views. There is no indication, anywhere that I have found, that Menno Simon endorsed the careless and quick excommunication over things that having nothing, whatsoever, to do with sin. In most cases I have seen, apart from the ones involving sexual immorality, or drunkenness, excommunication has been exercised over issues of opinion and rules not being followed, or some label such as ‘bad attitude, which usually comes back to a rule that is in no way connected to the word of God, the ten commandments, or any other sin. For many years I have found this troubling, and believed that this way of operating was based on Menno Simon’s teachings. It has been healing for me, though I disagree strongly with Menno’s view on shunning, to read his writings and see how strongly he sought to honour God. No where can I find any indication that he made decisions based on protecting church image, hiding sins of the prominent, or any other perverse and selfish control. It seems he tries earnestly to follow God’s word, while exercising his understanding of it, with fatherly compassion, a heart to restore, and no desire to wound or control. His prophetic word or questioning, that if repentant sinners are dealt with harshly, then how many will avoid repenting for fear of being shamed, has come to pass. Every adult with whom I meet as a coach and mentor, as we work through the aftermath of abuse, we also go through a time of confession and repentance for hidden sins. Most, if not all, share sins of which they cannot repent at church, for that very reason. Many have looked at me, tear flowing down their faces, as they tell me they wish they could have that kind of openness at church. I sat with a young woman this week, not yet nineteen years old, who had told me she is looking fora church. I asked her what she is looking for, what it is her heart longs for and seeks. Her answer took me off guard, coming from one so young. I might have expected, ‘no strict rules’ or ‘no man-made rules’, even ‘a lively church that is fun’. But she said she wants a place she can go and confess and repent when she has sinned, without fearing shame or judgement. She wants to live a life of purity and holiness, and have accountability, fellowship, and prayer support. “A place where I can go and confess when I have sinned…” No shame. No harsh discipline, unless it is a matter of crime. I think Menno would have applauded her. And I think he would have done his best to give her such a church home. Menno does address the issue of a person repenting, but not producing ‘fruits unto repentance,’ and says there is a time to discipline when the follow-through is not there. In such a case, my heart tells me to come alongside that person, struggle with them and understand them, disciple them, teach them, and they are far more likely to walk in victory. I know this because of the number of people I have discipled, who have overcome addictions after months, and years, of strongholds. While I don’t see eye-to-eye with Menno Simons, I have appreciated the wisdom in his writings, and can’t help but wonder where the church would be, if the passion for biblical truth, practice and understanding had remained as sincere as his writing portray…. He addresses numerous times, in his writings, the sin of materialism and the pursuit of riches, among other ‘sins’. As I read that, I thought of the church today. Almost any denomination. What has more power, more pull, more prestige, than materialism and riches? The practice of excommunication, with or without shunning, is not unique to Anabaptist churches, but seems to be most commonly practised among churches with Anabaptist roots. Excommunication is considered an ‘ordinance’, or ‘authoritative law or decree’, given by Christ and the ‘holy Apostles’, as Menno calls them, for the ‘church’. Because of how frequently this ‘ordinance’ is abused, it is easy to simply turn the other way, and not even try to understand it. Tragically, in my own experience and that of my years in the conservative Mennonite churches, I saw this practice abused in most vile ways. One man in his sixties, or thereabouts, was excommunicated for listening to radio, but the lead minister, who later became the bishop, carefully covered for his son’s immorality, when it was discovered that the son had sexually violated numerous youth. 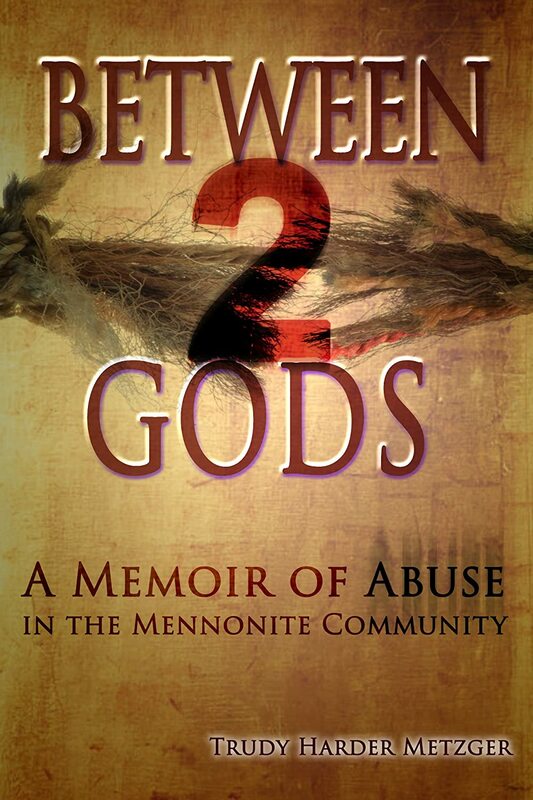 While the devastating reality is that his son had been dreadfully violated by a man in his late twenties or thirties–I cannot recall his age accurately–it was an imbalance to excommunicate one man for breaking a man-made law, while harbouring another who sinned outright, and directly violated God’s law. Over the span of several years, numerous members were excommunicated for violations such as bad attitudes, listening to instrumental music, watching tv, and various other ‘sins’, all while the young offender, and others like him, were protected. For this reason I still find it hard to trust anyone on the topic of church discipline and excommunication. Every church I’ve had connections to, who exercised any form of the ban, did so with this same level of corruption at some level of leadership. Having said that, I am very aware that only some leaders knew about the corruption, and they intentionally withheld that information from other leaders, or misrepresented it. There are good leaders who try to do the right thing, and are not always well informed. For years I skipped over Menno’s writings on the topic, and anyone else’s, for that matter. It all seemed to have become a perverse power trip in the hands of the wrong leaders, and hearing it from our ‘founding father’, as Menno was often referred to, didn’t appeal to me. What I read and understand in the Bible is a far cry from anything I’ve ever heard taught on the topic, and ultimately it is God to whom I give account for what I believe. Not a religion, denomination, or culture. Recently, though, something drew me into this section of Menno’s writings and I was quite intrigued. He is completely on target in some areas, and as far off base as anyone I’ve heard before, in other areas. The most disturbing of beliefs, in my opinion and understanding, is the notion that an excommunicated spouse needed to be shunned by the other spouse, and the family. That view quite stunned me. Menno goes to great lengths to prove and convince his readers that it is not only in the area of spiritual ‘communion’, or the ‘breaking of bread’ that Paul commands the church to break relationship, but to very literally not speak a word to the person excommunicated, in conversation, beyond an ordinary greeting of ‘good morning’, or the like. Taking this to the extreme of applying it in marriage, based on Menno’s article titled ‘Excommunication’ as well as ‘Questions and Answers’, then anything beyond common greeting and politeness would end with the excommunication of either spouse, leaving no room for marital intimacy, deep communication, or eating together. And that is precisely what I understand him to promote. Menno’s extreme views on excommunication here, and Paul’s teachings cannot both be accurate. Since one is the scripture speaking, and the other is another individual’s interpretation of scripture, I take the former at face value, and assume the latter is missing something. By comparing scripture with scripture, it is clear that there was a misunderstanding of excommunication as Menno taught it in relation to marriage, but in other areas he was more biblical than any church I’ve ever known, who use the ‘ban’. Menno quotes a lot of scripture throughout his writings, but rather than coming across as though he is ‘comparing scripture with scripture’, it seems as if he is using scriptures to endorse his particular view points. Viewpoints which he seems to sincerely believe are the most accurate interpretation of the intended message. In studying further, and looking deeper at Menno’s use of the ban, these extreme views are brought into balance somewhat in his caution about using the ban. It seems he did not carelessly or casually use the ban for things that were not scripturally wrong, or sin issues–there is no indication anywhere that he would do so. And if someone disagreed in this area of shunning in marriage, and a spouse would not agree to treating their excommunicated spouse with extreme shunning, he extended grace. 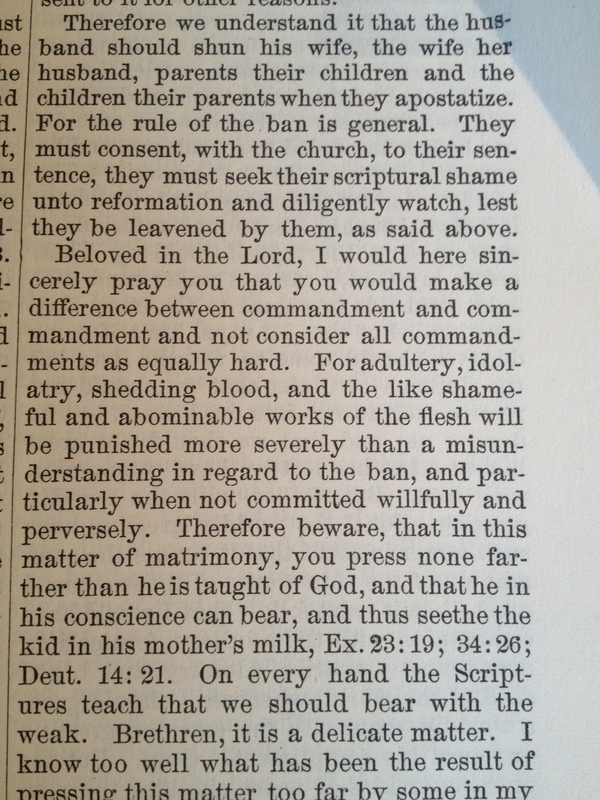 In explaining this, he encouraged the church to be aware that not all commandments are equal, and a misinterpretation–or what I would call a disagreement with his viewpoint–should not be viewed with the same harshness as murder, adultery and other ‘abominable works of the flesh’. In this way, it seems, Menno differentiated between ‘sin’, and interpretation of ‘ordinances’. While strong, and very black and white in his views, when the issue presents itself in real life, his ability to reason through it is obvious. He doesn’t want to wreck marriages, and the strong tone in his writing becomes more mellow.